At 12:18 PM, on the afternoon of 26 February 1993, a massive explosion occurred in the parking structure of the World Trade Center in New York City. Six people died, and more than a thousand were injured, as a result of the blast. Investigators discovered that a bomb inside a rental van had been driven into the garage below the Vista (later Marriott) Hotel. The hotel was building 3 (otherwise known as 3 WTC) of the trade-center complex. The above image, part of the "FBI Files," shows a glimpse of the damage which occurred on that cold, wintry afternoon. In addition to human costs, and significant business disruption, the tragedy caused $300 million worth of property damage plus $500 million in debris-removal and clean-up expenses. The following picture, also from the FBI files, provides another view of the massive damage. Yes, I am a terrorist and proud of it. Ramzi Yousef, one of the defendants convicted for the parking-garage bombing, is the nephew of Khalid Sheikh Mohammed (the accused master-mind of the September 11 attacks). Many individuals who went through the anguish of the 1993 bombing responded differently when the September 11 disaster occurred. They explain those differences in "The Human Factor" compiled by Stephen Murphy and published in the NFPA Journal (National Fire Protection Journal) dated September /October 2002. The NFPA also undertook an extensive study to examine the details of the 1993 bombing. The following is the Executive Summary of that report. 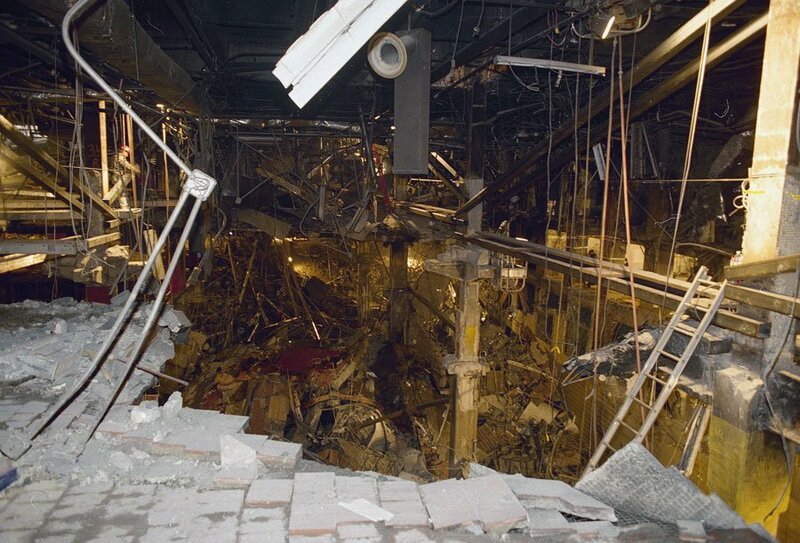 On Friday, February 26, 1993, a violent explosion ripped through a parking garage in the sub-basement levels of New York's World Trade Center complex, immediately killing six people. The explosion caused extensive damage in several basement levels and resulted in an intense fire that quickly distributed thick, black smoke to the upper levels of many of the complex's seven buildings, causing a massive evacuation. The explosion also disabled much of the fire protection systems within the complex, including the fire alarm communication system for the "Twin Towers," leaving evacuating occupants without emergency instructions during their prolonged escape. Many of the approximately 150,000 occupants within the complex were confronted with dense smoke on occupied floors and then in stairways as they began reaching the lower levels of the buildings. Further, the smoke-filled stairways were immersed in darkness when both the normal and emergency electrical power were interrupted. More than 1,000 people were injured during the evacuation of the complex, most suffering from the effects of smoke exposure. Unlike most fatal fire scenarios, however, there were no fatalities attributed to the effects of smoke despite the severe exposure to products of combustion and the lengthy evacuation time. The World Trade Center complex includes seven high-rise buildings, a shopping mall, and several levels of underground parking. The two largest high-rise buildings are 110 stories tall and are commonly referred to as the "Twin Towers." In addition to these high-rise buildings, there is a 47-story high-rise building, a 22-story high-rise building (Vista Hotel), two 9-story high-rise buildings, and one 8-story high-rise building. Excluding the hotel, most of the occupied space within the buildings is dedicated for office use. All of the buildings, except for the 47-story high-rise building, are constructed over a plaza area that contains the 60-store shopping mall, four underground levels of public parking, and two utility levels. In addition to the large number of people working there, the complex also serves as a commuter rail station, a connecting point for thousands of commuters into and out of the city and attracts thousands of daily visitors. A van containing explosives was parked on the B-2 level of the underground parking garage in a position adjacent to one of the towers and under the Vista Hotel. At 12:18 p.m., the explosives were detonated causing varying degrees of physical damage on all six basement levels. In the immediate area of the explosion, the floor slabs for two basement levels collapsed onto vital electrical, communications, and domestic water systems equipment for the complex. Further, masonry fire walls and fire doors separating the buildings within the complex were voided by the force of the explosion. The explosion also penetrated vertically into a first-floor public assembly area of the Vista Hotel and shattered several glass partitions that separated the hotel from the lobby area of one of the Center's towers. This penetration of the structures enabled dense, black, super-heated smoke from the explosive materials and the ensuing fire to quickly fill the lobby area and move into numerous elevator shafts. At the same time, the smoke, greatly accelerated by the extreme temperatures and pressures of the explosion, was forced horizontally throughout the basement area and entered additional elevator shafts through doors and walls damaged by the explosion. Once in the elevator shafts, the smoke spread vertically and began to fill the occupied areas of the two towers, the Vista Hotel, and another high-rise building in the complex. The degree of smoke spread into the buildings varied according to the extent of damage in the basement areas and according to the individual building's distance from the explosion site. The most severely affected buildings were the twin towers and the Vista Hotel. In time, smoke also spread into a fourth building within the complex; however, all seven buildings in the complex were evacuated. The initial speed of the smoke spread was influenced most by the explosion, and forces associated with the "stack effect," a natural, ever-present condition in high-rise buildings. The spread of smoke to the upper levels of buildings by the "stack effect" is common in high-rise fires. The explosion also interrupted most of the normal electrical circuits in the complex. In response to the power outage, the electrical demand was transferred automatically to some of the emergency circuits for affected areas in the towers, and diesel-powered emergency generators started automatically in order to supply power to the emergency systems. Shortly after starting, however, the emergency generator engines overheated and shut down because components of their cooling system were damaged by the explosion. Approximately 1 hour and 15 minutes into the incident, all remaining electrical power to the affected buildings within the complex was shut down. Once the detonation and subsequent ignition of adjacent combustibles occurred, the explosive forces and natural air movements quickly distributed products of combustion to occupied areas through horizontal and vertical openings, and soon total evacuation of the complex became necessary. Many occupants entered stairways and were confronted by the smoke. Later, due to the electrical power failure, the occupants experienced total darkness in the stairways and resorted to other means of illuminating their exit paths. The unexpected mass evacuation further influenced adequate performance of the exiting system since the stairways soon filled with people who were waiting for an opportunity to enter stairways and held doors open, thus allowing smoke from the respective floors to migrate into the stairways. The loss of the normal electrical service and of the emergency generators also affected the standpipe and sprinkler systems for most of the buildings. The primary water supply for the standpipe systems and some of the sprinkler systems was municipal water mains and electric fire pumps. The primary water supply for the sprinkler systems in the towers was gravity tanks which were not affected. With the loss of electrical power, the primary water supply was limited to that provided by the normal pressures in the water distribution system. Furthermore, the loss of electrical power to domestic water pumps limited the capability of the sprinkler systems in the towers to that water in the gravity tanks. Fortunately, the fire did not propagate from the basement levels and thus did not challenge the performance of the remaining fire protection features. Successful occupant response during a fire emergency in this complex is dependent upon a transfer of information from emergency personnel in the operations control center. After initial assessment of a reported fire, for example, selective evacuation of occupant floors would be initiated as determined by the control room operator or by arriving fire suppression officers. In this incident, however, the control center was destroyed by the explosion, leaving occupants without vital fundamental information from emergency responders. As a result, the occupants' response to the fire was uncoordinated, underscoring the necessity for all building occupants to understand and be trained in proper fire safety procedures. A detailed human behavior study of the occupants' actions in this massive emergency is currently being undertaken by the NFPA. The New York City Fire Department responded to the explosion and fire at the World Trade Center with 16 alarms, involving hundreds of fire fighters at the height of activities. This commitment represented approximately 45 percent of the New York City Fire Department on-duty resources and was the largest single response in the history of the New York City Fire Department. Several fire crews were committed to the suppression of cars and other combustible materials burning in the basement. Though the vast majority of the fire fighters, however, were committed to time-consuming tasks of search and rescue in all areas of the seven high-rise buildings and assisting in the care of escaping occupants. During the explosion and fire and the prolonged evacuation, six people died and 1042 people were injured, though there was a real potential for many more deaths and severe injuries. Many of the injured occupants suffered from smoke inhalation but, remarkably, none died from the exposure. This occurred primarily because there was a limited amount of combustibles that were initially ignited, and because of the basement floor collapse, there was limited fire spread to adjacent materials. Because of the limited burning there was a significant dilution of the products of combustion as they moved through this massive building complex. Had there been a more continuous burning or less dilution of the smoke, it is likely that the loss of life in this tragedy would have been far greater than the six casualties who were directly exposed to the force of the explosion. event," more reliable performance of fire protection components may be appropriate. Further warranting consideration is where the structures contain critical, private enterprises or government agencies, as was the case in the World Trade Center. Although fire protection designers normally would include a "single event" scenario in their performance criteria of fire protection systems, this single event at the World Trade Center complex has initiated an active discussion as to what a "single event" scenario should include. The NFPA believes fire protection designers and code officials should perhaps broaden their responsibilities to include security issues or other such subtle changes in our society in achieving dependable and reliable fire protection system performance for such critical occupancies. The complexity of this incident also demonstrates the importance of compliance with fundamental fire protection requirements for high-rise buildings. The growing inventory of high-rise buildings in this country should be reviewed to ensure that minimum levels of fire protection are present. Further, recent fatal high-rise building fires have demonstrated the importance of inspection and maintenance of these systems. One of the more recent high-rise fires resulted in three fire fighters losing their lives, further underscoring the importance of fire safety requirements for these buildings. Finally, owners, insurers, security, fire protection professionals, and code developers may want to re-examine fire protection designs in high--rise structures, especially where those structures accommodate large numbers of people and the economic impact is great, to ensure that the protection systems achieve a high degree of reliability during a "single event" occurrence. The NFPA's Life Safety Code® addresses occupant safety in both new and existing buildings; an important consideration in fundamental fire safety principles in the built environment. The federal government released an investigation report regarding the disaster. What would have happened if the 1993 World Trade Center bomb had exploded around 5 pm on February 26, 1993? Do you think the terrorists had considered that possibility? What do you think the terrorists were seeking to accomplish when they planted a bomb in the World Trade Center's parking garage? What was their motive? What turns people into terrorists? Do you think terrorists feel regret for causing death and destruction? Bos, Carole "World Trade Center Bombing in 1993" AwesomeStories.com. Jan 06, 2014. Apr 23, 2019.